I have some big news to share! I recently quit my job at General Mills to focus on my blog full-time. This was a huge decision for me to make, but after realizing how unhappy I was working on my corporate full time job, blogging at night and having virtually no social life, I knew it was time to make the change. Actually I needed a change in my life. I have always been a passionate person and I realized that I wasn’t practicing what I preached. I was resisting change and moving forward because I was scared of the unknown. Bottom line, I wasn’t doing what I loved and I knew that I needed my heart to be in my work. They say that doing what your afraid of will set you free. This has been so true for me. My creativity is alive again and I’m beaming from ear to ear. My entire attitude has changed. To give you a little more perspective: A few months into Ambitious Kitchen, it become my passion. I wanted to share my love for food, encourage healthy living and share my experiences with all of you! Initially, I always thought that climbing a corporate ladder would make me happy and determine my success, but that wasn’t true at all. I decided that my success was going to be determined by me, living wholeheartedly, having freedom, being creative, and uninhibited. I didn’t want to be a slave to something that I didn’t care about. Each and everyday I walked into the office and felt as though I was a robot. Not only that, but the job was incredibly stressful and at the age of 25, I didn’t NEED that. I wanted to be able to explore my passions and to gradually work through my fear of the unknown. So one day I walked into the office and walked away from stability, a great salary, a title, and everything I knew. And it felt amazing. There are no regrets! If blogging full-time doesn’t work, that’s okay with me, but at least I tried and took the risk. That in itself is worth it. Many people have asked me how to grow a successful blog, but I don’t have one answer. I certainly don’t think that this blog is perfect nor did I ever think that I would do it full time. For many, I think it’s hard to try understand how you can make any income from blogging, but it is possible! It’s a combination of many things but most of all it’s hard work and passion. If you have both of those, I believe that you can be successful in anything you do. Most of all, I’m successful because of you! You all have made my recipes, shared your personal stories, introduced Ambitious Kitchen to your friends and family, and I couldn’t be more appreciative! SO THANK YOU! Now a few quick notes on this pumpkin bread! 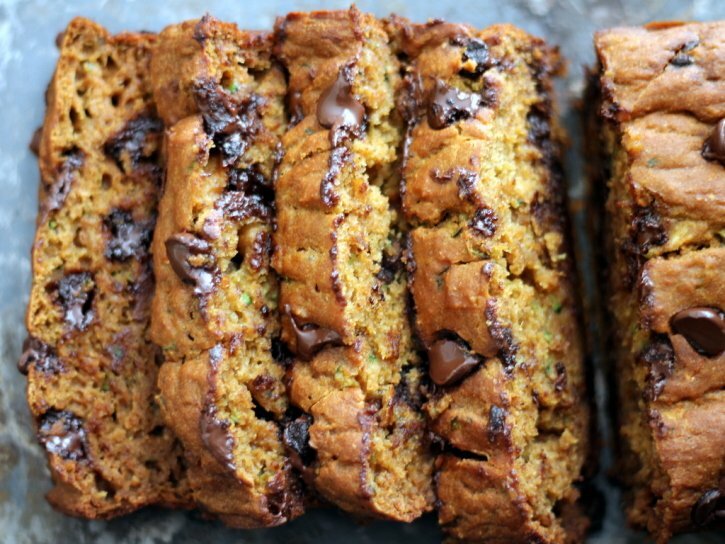 Uhhh it’s amazingly moist from both the pumpkin and zucchini, low fat, and made with whole grains. You will absolutely love the flavor and moisture of the bread. I couldn’t get enough of it. I made a loaf for my mom and one for my best friend and then couldn’t resist making a loaf for myself and sticking it in the freezer for when company comes. I think this might just be a new favorite! To keep it light, I used honey (but you could try maple syrup), minimal oil, and almond milk. I think you guys are going to LOVE LOVE LOVE this bread. If you make it, be sure to share your creations with me on Facebook or Instagram using the hashtag #ambitiouskitchen! And again, thanks for being here. I adore you. xo! 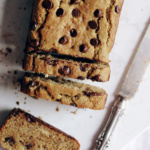 You can use different types of chocolate chips to make this bread your own. Add in a handfull of toasted pecans or walnuts for healthy fats. 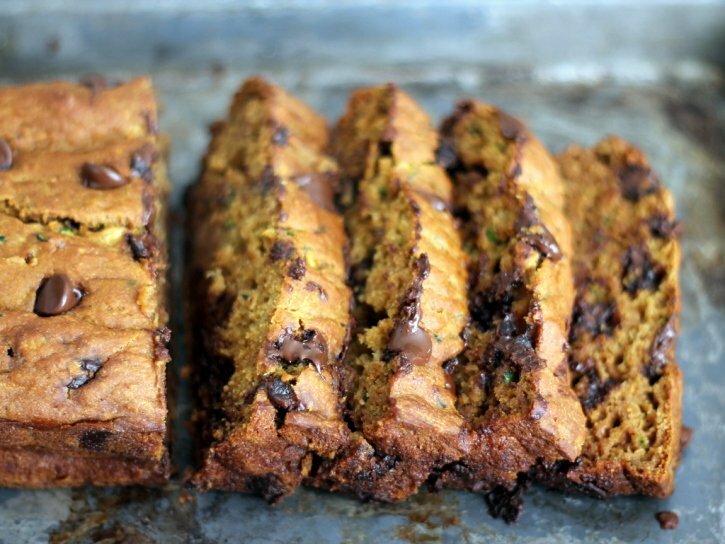 130 Responses to "Healthy Pumpkin Zucchini Chocolate Chip Bread + big news!" Oh. My. Gah. Sooo good! Crazy moist! Love it! Im trying to not eat the whole loaf. You are a recipe genius! Congratulations Monique! A brave move, but one you will never regret! I will be cheering you on and I’m looking forward to seeing how AK will grow now it is your full time gig! 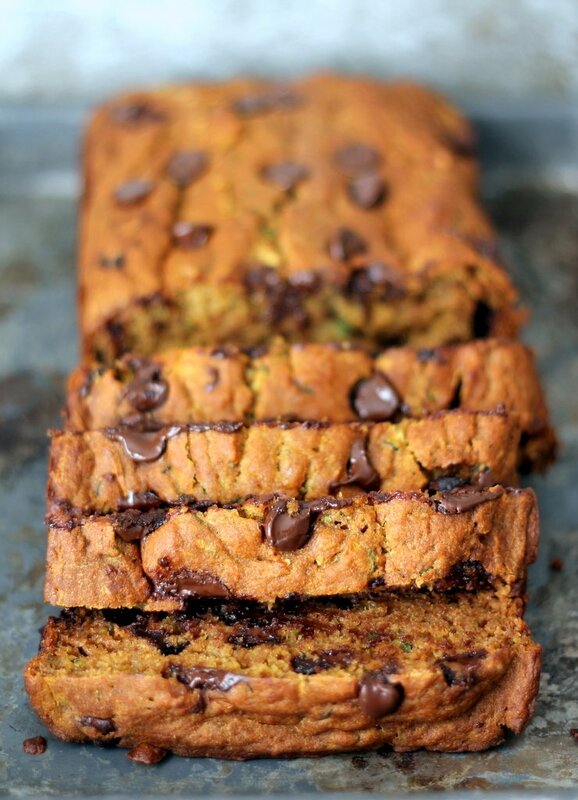 This bread looks amazing – the pumpkin and zucchini together sounds like a perfect combo. Congratulations on the decision to focus full-time on your blog…how exciting! Thrilled to hear that you’re planning on focusing on the blog! Know the rest of us will reap the benefits with all of your awesome recipes. Congrats! Congrats! I’ve always loved your blog and I am toying with the idea of doing the same (only probably not blogging, but doing something entirely different than what I’ve been doing the past 12 years!) Good luck to ya! Congratulations! I can’t wait to see what great things you do. Maybe you’ll be able to be with your boyfriend more now too. Yay! And of course, this bread looks amazing- pinned to make soon. Congrats and somehow I already knew this? Maybe from FB posts or something? But I remember reading it recently and thought GOOD for HER!! Blogging FT has its own set of pressures but at least you’re working for yourself and not going into an office every day and can be as passionate as you want and do what your heart is calling you to do! I totally understand. Gorgeous bread – pinned! Great news, Monique! Congrats on making the change. Looking forward to more great things from AK! Congratulations! I wish you much success. And this looks amazing! Gah Monique, I’m thrilled for you! I made the same leap earlier this year — haven’t really announced it on the blog — but it’s been the best decision I could have ever made. When working full time while blogging and health coaching on the side (and trying to have a normal life) I felt like I wasn’t able to give 100% to anything. I literally felt like I was floundering. I’m still crazy busy and it’s a hustle being self-employed but it’s fun and I proud to say that I LOVE my job because so many people spend their entire life unhappy or unfulfilled by their jobs. I love your site Monique. Well done. :) Could you let me know if mash pumpkin would be the same as can? As I live in Australia, I don’t think can is available here? Would love to try this breads looks so yummy. Cheeers to full time blogging!! Wishing you all the best girl! And what a great recipe to begin it off with! Wow you go girl, very brave and inspiring! I love your blog, the recipes and stories. Hi…….would this recipe work with almond flour? Thanks for your help. I’m SO HAPPY to hear this. After following you for a while now, it’s been fantastic to see your ever-growing success. I recently quit my job as well, and am so enjoying dedicating more time to myself and my passions. Best of luck, and can’t wait to see what it has in store for you. Good luck and congrats on your big leap @ambitiouskitch! I love your blog and your #healthy #recipes and I wish you all the best! Going to attempt this recipe with some #glutenfree flour sometime VERY soon. Yum..
Hi! I was just looking around on some blogs and I must say that you’ve got great pictures and good articles! I really like it! Congratulations! 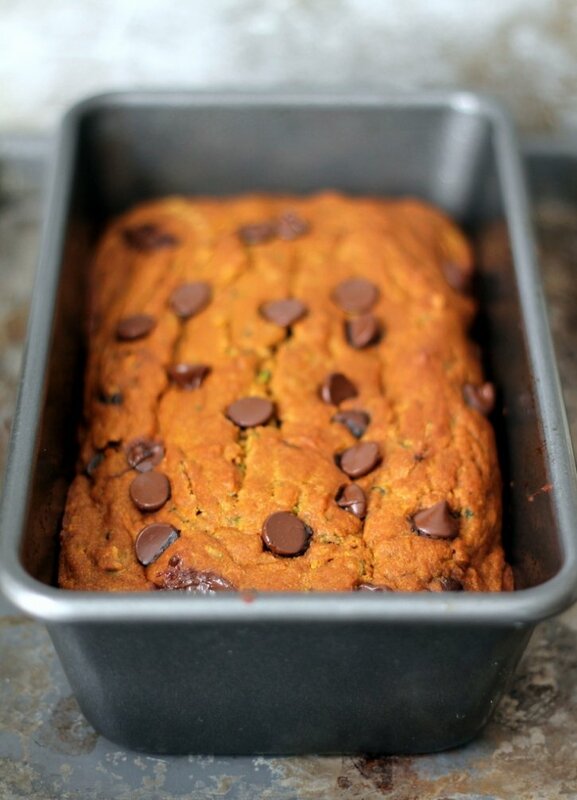 Such an exciting move for you and I must have this pumpkin bread asap! Congrats on your news! What an exciting big step you are taking. I wish you luck! And this bread looks simply amazing. Pinning it for later! Does this mean we’ll be seeing even more recipes??? By far my favorite blog! Congratulations on being able to follow your heart, such a bold move! I was so moved by your recipe, I made it immediately! The only change I made was to add dark chocolate almond milk. I wasn’t even able to wait until it had cooled before I dug in….delicious!! Thanks for sharing and best of luck! I am so happy to hear the great news Monique! Your blog is one of the first I ever read and baked from!! I love your delicious recipes! Good luck in the future! Can’t wait to try this bread! first and foremost, CONGRATULATIONS!! This is a huge step, but I’m sure you feel more than satisfied!! If you continue baking like this, mama-mia, I for one know I will be coming back more often 🙂 Great recipe!! Hi ! I just came across your recipes and story. Thank you for following your heart – it helps the whole world! This, the Kale Rainbow Detox Salad and many other recipes look fab. Can’t wait to start cooking. Wishing you the best for your life. Thank you Lana – you are too sweet! Just made these into mini and regular-sized muffins and they’re awesome awesome awesome! Not to mention pretty healthy and low calorie too (~45 calories per mini muffin!). I will definitely be making these again. Thanks for the awesome tip on baking them in mini muffin pans. I need to get one of those! I havnt been cooking for to long, When you say you add a pinch of nutmegs,cloves or ginger would you say about a 1/4tsp? Hi! Looks great! Do you think it would work with fresh pumpkin, roasted and mashed? I tried making this without the chocolate chips and it was not very sweet or flavorful–but it’s so healthy that I’ll definitely try it again in the future once I have chocolate chips on hand. Thanks for the recipe! 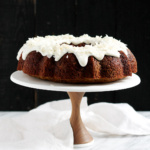 Can you use coconut flouer or a gluten free flour for this? If so would the amount differ? Oh my goodness. I made this the other day replacing the zucchini with 2 ripe mashed bananas and it was EASILY one of the best things I’ve ever made! Thank you so much for the wonderful recipe! Ground flaxseed & water. Google “how to make a flax egg”. I made this yeasterday one loaves for myself and one for the family I nanny for. I put chocolate chips in the loafe for them but not mine. I’m not sure if I over baked it or what but it’s not super pumpkiny and it’s not as moist as a not healthy quick bread. I like it ok but I’m going to experiment and try upping the pumpkin and baking it less. After buying the ingredients last week, my mom made this for me today (yay for moms, LOL) and it was delicious! I was concerned that using only whole wheat flour might leave it dry but it was moist and delicious. Not super pumpkin-y but that’s okay since I’ll be attempting to give it to my 3 year old boys later. I’m hoping the chocolate chips will win them over. I will be making this again! No there isn’t a typo. I’ve never had anyone have an issue with the recipe and the amount of baking soda. Did you follow the recipe exactly? This was one of the TASTIEST things I’ve ever made! Used all purpose GF flour instead and it came out great! Loved it! I just made this and it turned out so well! I love it! I just made this recipe today. But I used regular milk instead of almond milk and regular sugar instead of honey. It was very moist and just slightly sweet. Very tasty! I have peeled and shredded zucchini in my freezer. Do you think I can thaw that, drain, and use it for this recipe? Otherwise, I was just going to toss it into soups/stews, etc. Thank you! Hi Monique! I just LOVE your work. I always turn to your blog when I need some recipe inspiration 🙂 I snap chatted you a couple days ago sharing my story about working at General Mills and my plan to start my own health coaching business in the near future! Thank you for you constant inspiration!! I have a question regarding this bread recipe. Can you substitute with a gluten free flour? What would you recommend? Hi Monique, I love all of your recipes and they are always my go to! I have a few very ripe bananas so I was wondering if I could sub those for the zucchini? If that would work, how many bananas would you recommend? This recipe is pure gold!! So glad I found your blog! It has just the right amount of sweetness. I don’t usually love things with chocolate in it for breakfast, but this is just too good! I’ve been taking it for breakfast all week and it has seriously been the highlight of my morning. Planning on making another loaf once it’s gone! made this today-delish!! 2 thumbs up!! I want to make this with coconut flour. Would anyone know how to make that work, maybe another egg or more milk? 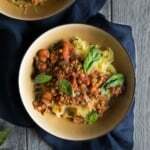 I just happened upon this blog today, while looking for a turkey chili recipe for book club this week. After clicking a few times, I found my way to this particular recipe and just had to try it out. Let me be honest — I am not a cook, baker, etc. Most nights, I get a salad from the salad bar at the grocery store or microwave some fozen veggies for dinner! So, this was my very first time making any kind of bread (sweet or otherwise)! I had a mini loaf pan from when someone else gave me some lemon poppy seed bread last holiday, and decided to use that to try this out. It’s a 5.5-in loaf pan, so I basically cut the recipe in half. IT WAS AMAZING!! So easy and so moist. I will definitely be making this to bring to others’ places for the holidays! Thanks for the wonderful recipe! I’all be trying some of your other ines later this week! (And I’m in Chicago if you’re ever looking for a book club to join :)). I don’t have any zucchini and wasn’t wondering if I can still make this as is? Or do adjustments need to be made? Love your site! I tried this recipe and had to share on my blog – It was amazing and perfect for the holidays! You can view at taylordnutrition.com! Made this recipe following instructions exactly and next time I will just have to opt for sugar or brown sugar as the honey was not a sufficient sweetener for my kids to enjoy. I made several loaves to gift to neighbors and feeling a little let down. Monique, first, let me say that I just love this recipe as is! Thank you for sharing. I did, however, replace the flour (for someone who is gluten free) with 1 cup of pureed black beans and 1/2 cup of chocolate protein powder and it turned out to be delicious. Looking forward to following you! Wonderful! This is on my favorites/make again list. This recipe looks so good, I cannot wait to make it! Thanks for sharing! 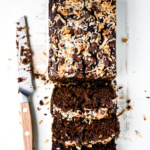 Do you think it would be okay to make this with coconut flour? Never mind I seen another post that asked this question. Thanks. was looking for a recipe to use left over buttercup squash pie filling. the muffins turned out fantastic. thanks! Delicious, though I can’t help fiddling a bit, hope you don’t mind- to make it more plant-based, I used the maple syrup, a chia seed egg replacer and a large Tbls of applesauce instead of oil- some raisins and dried cranberries for the choc. chips this time, will certainly save the basic recipe! Hm – I was so excited to make this and didn’t have whole wheat flour so used normal baking flour – but otherwise followed everything else to a T. After 2 full hours of baking it STILL wasn’t set. The outside is hard as a rock but the inside is like mush. Looks like other people had success so not sure what happened. 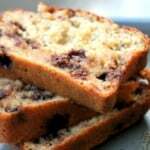 This is one of my favorite breakfast bread recipes! I’ve made it 3-4 times in the last couple of years and it’s dependably delicious! 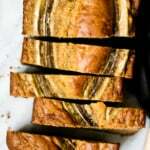 This is delicious the perfect fall baked good with great ingredients! I just ate two slices of my first loaf, yum! If make an extra loaf to put in the freezer how do I serve later? Do I thaw and rebake…? You can just thaw it out if it’s already baked! These were good! (I made mini muffins.) My whole family liked them, including my picky kids. The chocolate chips give just the right touch to make them tasty even though they’re healthier—I got one mini muffin with no chips in it, and it was not really enjoyable. But I love when things are healthy, especially breakfast food, so this is great! I think I’ll sprinkle sugar on top next time, since they turn out a bit cakey, without the great, crispy top that muffins usually have. Love mini muffins! So happy to hear that everyone enjoyed them. 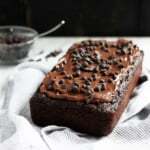 This loaf is naturally sweetened, so the chocolate chips definitely add a bit more sweetness if you’re looking for more of a treat. Sugar on top will help with that, too.